A nation saw a batter clearly beaten to first base; an umpire saw it the other way. But that mistake led not to retribution but forgiveness and tears, thawed U.S-Venezuela relations, and a realization that the whole mess made us all better, more compassionate human beings, if only for a moment. The worst team becomes the hottest ticket, all because of a 21-year-old who reaches 100 miles per hour and actually exceeds expectations that had a year to build — all as a transit system, ballpark and Wi-Fi network strain to handle the sheer fandom. That’s how, in the former example, we’ll remember Armando Galarraga’s not-quite-perfect game and Jim Joyce’s inexplicable call of “safe”; the latter is the simply awesome debut of Steven Strasburg. Baseball’s in full swing, but early-to-mid June is not a time where it dominates the sporting conversation. The Stanley Cup was in play, the NBA Finals continue, the quadrennial World Cup is starting, and even the NFL, tennis and cycling Lance Armstrong demand some attention. Why is baseball the main course right now? Part of that answer is, I believe, social media. Why do I think this? Baseball is a perfect game for social media and, by extension, the Internet. Games progress in an orderly, easily explained fashion, but rarely too quickly, and there are numerous opportunities for side topics, statistical research, looking ahead and outright speculation. The NFL has some of this, with its numerous commercials and time between plays, but it is a game whose action is not easily described in text chunks. The NBA and NHL move too fast for even a gamecast to be very efficient, much less a Twitter feed. When Armando Galarraga was pitching his perfect game, and when Jim Joyce altered history, ESPN’s and MLB’s live gamecasts told you the basics of what happened, but Twitter (and to a lesser degree, Facebook) carried the outrage and the disbelief. When the incident happened, it wasn’t just the idea of watching “SportsCenter” that night or the next a.m. to see the video. Maybe you would, anyways. But there was furious and fast conversation online, at websites and on Twitter, within moments of it happening. Screenshots of the runner, clearly out, were posted within minutes. Then the criticism rained down. The judge, jury and executioner acted in the time it takes to walk down the street and get a coffee — but most importantly, they were accompanied by a gallery of millions of spectators, scattered across the Internet. So social media carried breaking news? That’s it? Well, no. The reason this situation ended so heartwarmingly is largely because of the grace of Galarraga, Joyce and a calmed-down Detroit Tigers team. But part of why fans were so accepting is because of the tremendous back-and-forth on Twitter over what should be done. That, in turn, justified further coverage and a digging into the emotions of those involved. Talking heads didn’t individually dominate the conversation this time — a legion of Twitter users collectively did. Where does Steve Strasburg fit into this? The Strasburg phenomenon (which sounds like a particularly bad “Big Bang Theory” episode title) is much more a case of “media being social” than strictly social media. The hype over Strasburg has been in the media, but it’s been sustained online. Ticket sales were spurred by people’s perception that his first big-league start was an event — a place to be seen and to talk about. Websites, blogs, Twitter, StubHub — all of these magnified that perception and intersected, fractal-like, to magnify the magnification. A pitcher’s debut is also where baseball has an edge over other major team sports. The pitcher is alone when he works — he has a singular impact on the game’s outcome that football and basketball can’t match. And even baseball fans who prefer good hitting love a war between a great pitcher and batters. At the game, the crowd truly was tuned into each of his pitches. 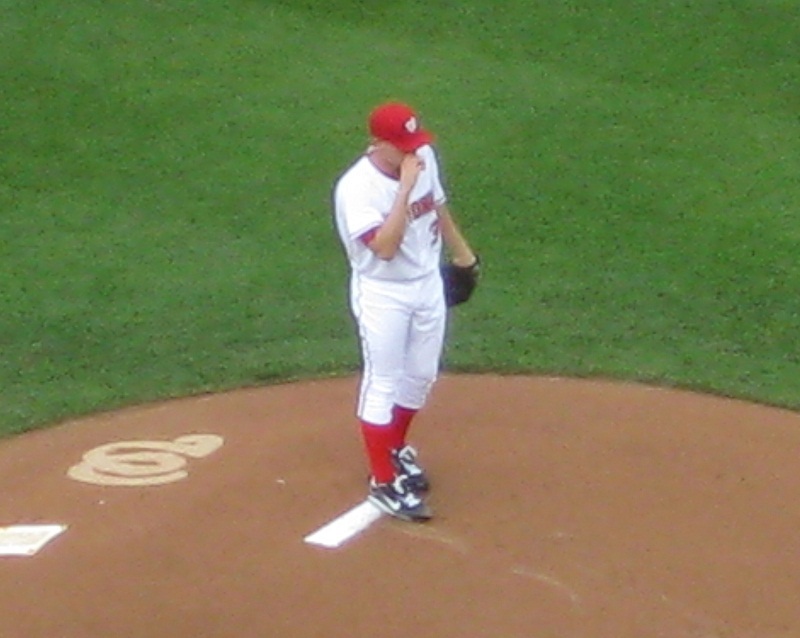 But they were also tuned into documenting Strasburg’s debut through photos (to be posted online, likely), tweets and text messages. Why do I think this? Because people’s cell networks were slow, jammed or down for much of the game. Does this normally happen at Nationals Park? Not that I’m aware of. What can we learn from this? Well, this wasn’t crowdsourcing or social media of a hard news or investigative nature — everyone (except Joyce) could see he blew the call; everyone knew when Strasburg was pitching. This was, however, social media and crowdsourcing of an emotive kind. People cheered, yelled, cursed and cried out — reactions online and off driven by the game of baseball. Sport is about stirring emotional attachments. The game itself has done a great job of that in 2010, and social media has helped amplify that feeling. If Major League Baseball is smart (and, well, that’s an “if” of epic proportions), it will continue to build and encourage that organic engagement — one that I believe can become unmatched in U.S. professional sports.